Love. What comes to mind when you think of that word? Clearly, it’s not a word we associate with business. The words we typically associate with business are words like – being tough-minded and savvy. Too often, business has a “eat’m up and spit’m out” vibe to it. Why is the word love, and the practice of being loving, so divorced from business? Why does it sound almost laughable to invite it into the game? Perhaps because it feels soft and we fear it wouldn't produce results. Perhaps we think doing the right thing and coming from love would cost too much. Or (we might not want to admit this), maybe operating under the banner of “it’s just business” gives us permission to behave like jerks. We business people have to develop this harden edge if we want to succeed right? Jack Bogle built Vanguard on this principle: “Hire nice, smart people and ask them to hire nice smart people”. His Administrative Assistant battled cancer three different times during her life and he hired her back each time. How is Vanguard’s performance these days you ask? Since being founded in 1975, Vanguard has grown to become one of the largest no-load mutual fund companies in the world. Janssen Pharmaceuticals and their parent company J&J, trust their employees so much they pretty much can work from where ever they want. When they are in the office, they encourage their employees to participate in company sponsored, non-work related activities like team sports, photography or cooking. All of this “playing around” is done DURING work time. They feel that this casual interaction, based upon common interests, will help spur collaboration in the workplace. How is Janssen and its parent J&J suffering from all of this love and leniency you ask? In 2013 MedAdNews magazine declared Johnson & Johnson to be the most admired company in the pharmaceutical, biotech and biotechnology industry. The magazine wrote that the company has doubled its productivity in the last four years. Huffington Post recently penned an article highlighting the 11 reasons to love Costco. http://www.huffingtonpost.com/2013/11/19/reasons-love-costco_n_4275774.html. Highlights of the article include Costco pays its employees a living wage, gives them benefits and never marks up their products by more than 15%. How is this untraditional, caring approach to business paying off for the company? This headline will give you a clue: “Costco Posts 4Q Profit, Results Beat Street Expectations”. I’ve been in the closet about love and business for years – knowing in my heart of hearts, that it’s a great way to run a company. Heck, it’s how we run our company. Over the years we've had different employees and we've loved them all. Some have moved on to different positions but we still maintain and (mutually) benefit from terrific relationships. We love the people who work with us and they love us back. It’s why when our cash flow was tight, our Office Manager voluntarily offered to decrease her salary by 25% until the money started flowing again. We love our clients – always doing our best to act in their best interest. And truth-be-told, we've been advising our clients to take actions that are loving for years, but we've been very careful to never use that word! Well no more. We are coming out of the closet. Want to decrease silos and increase collaboration? BE LOVING. Want to increase sales? Tell your sales team to BE LOVING. Want to increase customer loyalty? BE LOVING. Want to inspire innovation? BE LOVING. 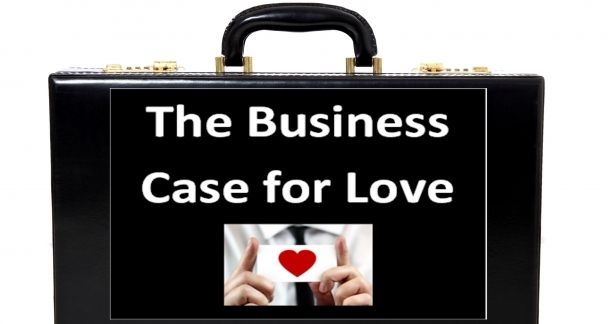 I’m in the process of writing a how-to book on Business Case for Love. It has one chapter. That chapter has one page. That one page has two words.